Getting started in Horse Agility is easy if you start at the beginning! We are all guilty of going too far, too fast because we want to achieve the best we can do but when you have horses and scary things in the same picture we can sometimes get more than we bargained for! 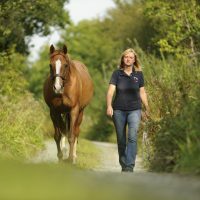 The simple How to guides linked to this page will help you progress safely so that neither you nor your horse get in to trouble. These ‘How to notes’ are only a simple guide, The Horse agility Handbook is a complete guide starting with the psychology of the sport to competing your horse at liberty at the highest level. Build good solid foundations…turn your horse loose…and fly! Training a horse to do Horse Agility is not difficult, the biggest challenge is to forget a lot of myths we’ve been told about horses and this was the first thing I had to investigate when I started the Club in December 2009. I had a look at Dog Agility to see what was different in the way they trained, handled and competed with their dogs compared to how we handled our horses. Firstly they had no leads or other restraints, secondly they had no whips or sticks to hit or threaten the dog if it made a mistake and thirdly the dogs moved loosely and with great enthusiasm over the course. Would horses be able to do this? There was only one way to find out I had to try! 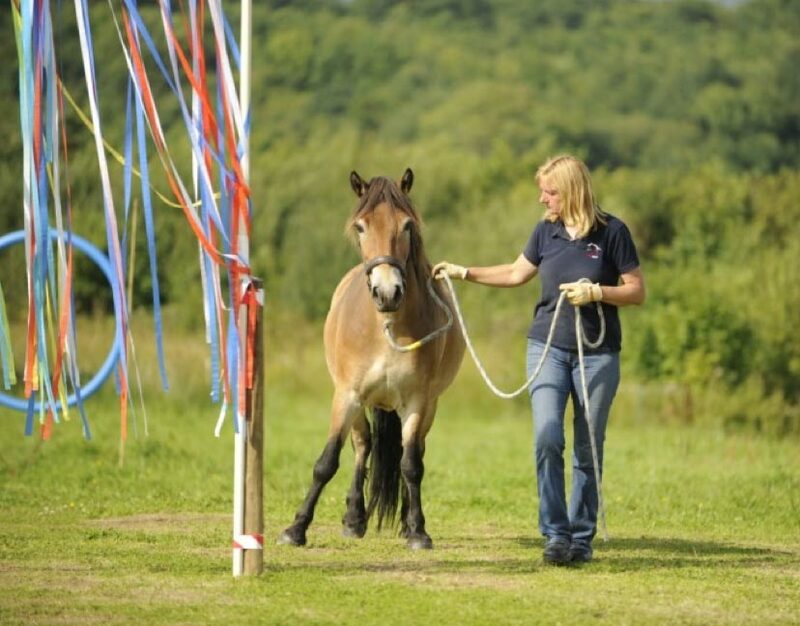 The ultimate aim of Horse Agility is to work the horse loose over obstacles just like in Dog Agility but just like Dog Agility you cannot just turn up on the day and think it’s going to work! The training of horses to do Horse Agility is almost identical to Dog Agility, dog trainers teach the dog to lead, then to go over obstacles on the lead while using body language and verbal commands and then one day they turn him loose in a safe place and using the same signals see if they can still direct the dog over the obstacles. The first things that I decided weren’t needed were bits or whips but long ropes were necessary otherwise the horse would be unable to move freely, I decided that between 10 and 15 feet in length was ideal. Any headcollar would do as long as it was suitable for the horse in design and size. The only other things we might need were rugs and safety boots but apart from that the tack needs were few. As long as the handler is suitably and safely dressed to be around horses on the ground there is no dress code in Horse Agility. However to wear a hard hat or not has got to be the responsibility of the handler. In official competitions hard hats must be worn but you must decide whether a hard hat is needed to handle your horse safely on the ground. 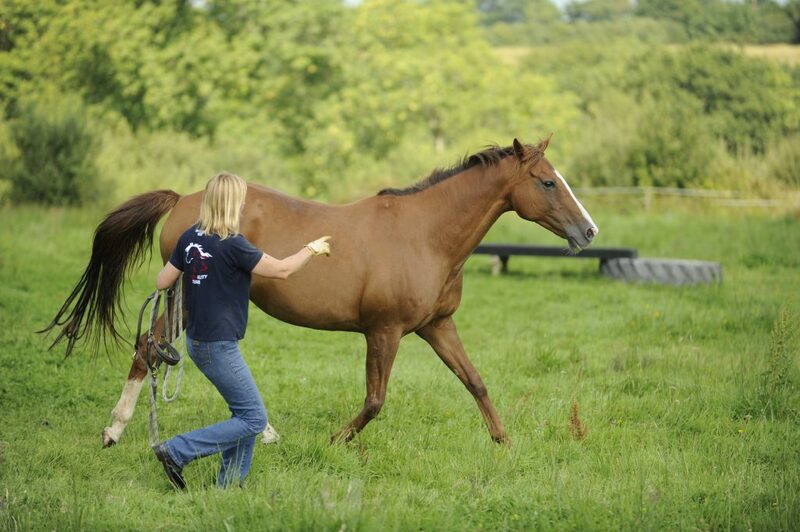 We train the horse to lead – forwards, backwards, right and left and halt. We train the horse to negotiate obstacles on the lead. Then we turn the horse loose in a safe place and see if our training is working. If the horse leaves you he’s saying he’s not comfortable being with you so we need to look at what we can do to become a nice place for the horse to be. Tell him by using your voice gently – not by bellowing ‘Good boy’ in his ear! Stroke him softly, or scratch him where he likes it – horses don’t like being slapped. Feed him treats but remember timing is extremely important here – you want him to work for you not the food. And lastly believe it or not it’s to leave him alone! Some horses hate being messed about with and if food isn’t his motivation just by you being relaxed and happy and sharing his space is enough to make him feel secure and comfortable. Being miserable, angry and negative is enough to cause a horse to leave in a hurry! The basic training is not a long process we’ve had horses arrive at our playdays completely out of control pulling their owners all over the lorry park and their owners terrified but just by completing a few easy steps most have unclipped the rope and have completed obstacles with the horse moving beside them within a couple of hours. The body language and verbal commands for each of these movements must be the same every time. You can’t say ‘Go Backwards’ one minute then ‘Backup’ the next the horse just won’t connect the two! The aim is to get rid of the rope don’t use it unless you have to, it’s only there if your voice or body language doesn’t work. Most of us assume that we can lead our horse but if we’re honest how often does our horse pull us along and because it’s going in the right direction we just let it happen? Let’s start by making sure we always lead the horse on a loose rope and he doesn’t pull us along. If he starts to pull turn sharply and go in the opposite direction don’t try and pull him to a stop he may just win that tug of war! Once the rope is loose you can turn and head in the direction you want again but every time he pulls you need to turn and show him that he won’t get what he wants by pulling you about. 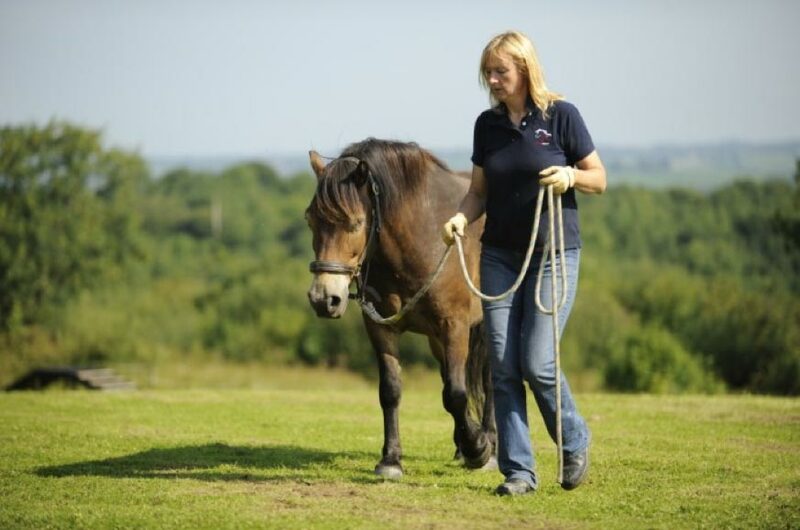 Make sure you can lead your horse forwards, stop and go backwards. We are aiming for the leadrope to be loose at all times and only there when our voice or body cues need reinforcing. Verbal commands could be Walk on, Back up, Halt and body language could be hand raised directing forwards, hand held up without moving for halt and hand tapping the air to indicate backwards. This is something that can easily be practiced while moving your horse around the yard and to and from his field. It’s important not to skip this foundation work. If you and your horse rely on the rope you will never turn him loose because he will always be waiting for the rope signal. Once you feel that this is all working you can start to play around familiar obstacles. Here I am leading Ollie on a nice loose rope, it will be easier for him to work loose with this training because we are not relying on the rope for communication. Here I am dragging poor Ollie along he is unhappy and braced against me. When I turn him loose I think he’ll leave! 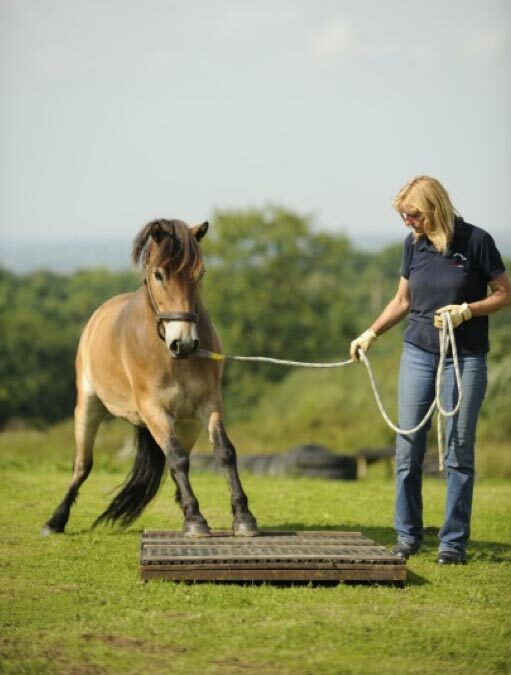 We can use natural horse behaviour to help the horse become used to unusual obstacles. In the early stages it is safer for the horse to be wearing a headcollar and long lead rope. He should be aware of what is happening and listening to the handler. He should stand quietly but not frozen – unless he has been asked to move when he should remain calm and controlled. The horse should be safely and softly bent round to the handler so that if he moves his hind quarters they will step away. The handler should always been on the same side of the horse as the scary object because if he spooks he will then spook away. He should not be told off for spooking, ignore it! 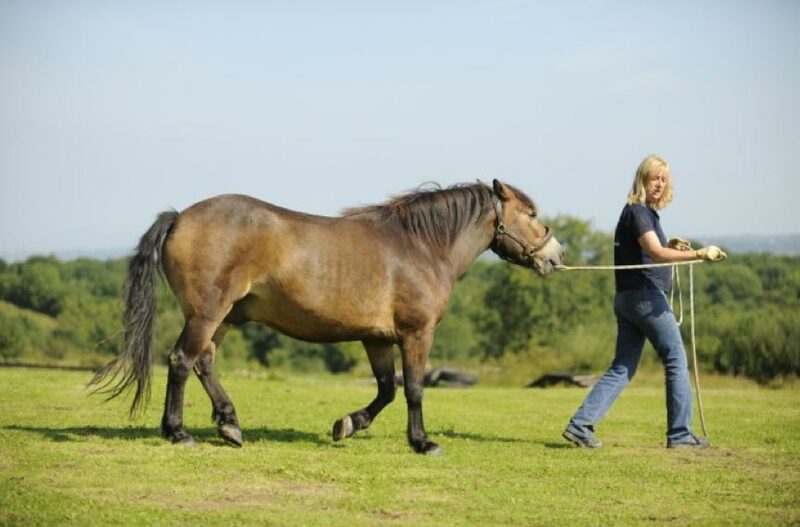 If at any time the horse becomes frightened and tries to leave then the handler has gone too fast and needs to put a greater distance between the object and the horse but not remove it completely. Establish a comfortable place some distance from the obstacle. Lead the horse towards the obstacle and as soon as you feel him hesitate stop and relax, wait for him to relax with you then return to the comfortable place. This is where you need to really understand what your horse looks and feels like when he is just a tiny bit afraid and when he is quite confident. The timing of when you stop, wait and then return to the comfortable place is very important. If the horse gets so frightened that he is jumping about or pulling then you’ve gone way too fast. Because Crossing a Tarpaulin looks so easy we often rush this simple obstacle causing the horse either to rush around it or stick his feet so that you cannot lead him forwards. There are many ways of training a horse to cross calmly and confidently but this is the way that works for me. I completely ignore the tarpaulin. That’s it, that’s the secret. I wander about the training area practicing my leading techniques and we just happen to wander near the tarpaulin every now and again. By focusing on the tarpaulin we become fixed on getting the task done and once we start to put pressure on things don’t always happen as we planned. Many horses will just try and ignore that the tarpaulin exists and I feel a real triumph as these horses show even a glimmer of interest by sniffing or pawing then I take them away and that’s my job done for the day. In this picture Ricky is in danger of pushing right into me away from the curtain. Going round the cones looks easy but it’s not so easy to keep a smooth even line. It should look like you and your horse are one unit flowing through with an even wave pattern maintain- ing a consistent distance between you and the horse. Once the horse and you can weave through the cones smoothly at walk you can try it at trot. 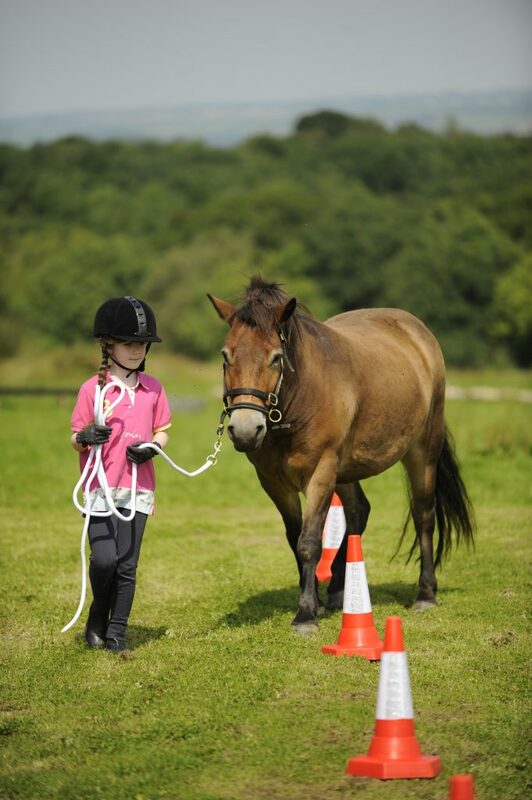 Then try moving alongside the cones while directing the horse to weave through them first at walk then at trot. 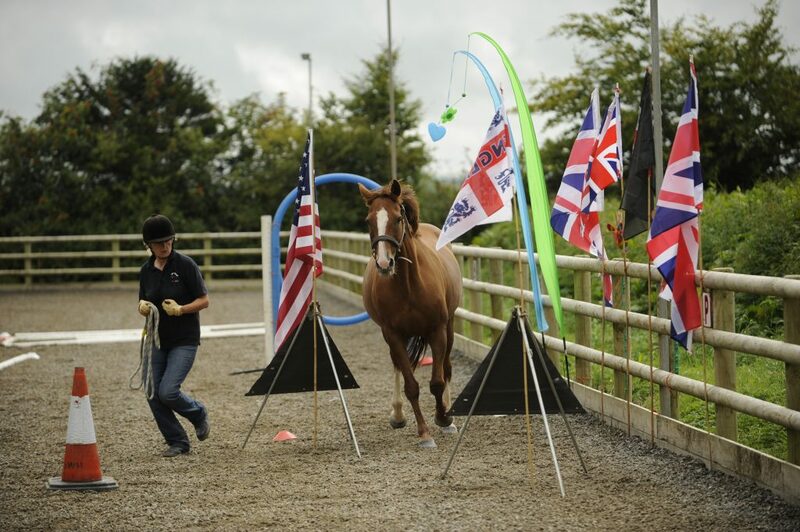 You can use bunting, hazard tape, flags anything that is new to the horse. How do we get started with our horse without scaring him? If you watch a group of horses see a new obstacle in their field. They will establish a comfortable place some distance from it and examine it from a distance then they approach it to learn more about what it is. They will move backwards and forwards towards the new object returning to the comfortable space whenever they feel it’s too scary! This is called advance and retreat. Eventually they rest their nose on the object and satisfy themselves that it won’t eat them. With any of these obstacles set yourself small achievable tasks that you almost know you’ll get then leave it and go and do something completely different. In other words stop while you’re ahead!